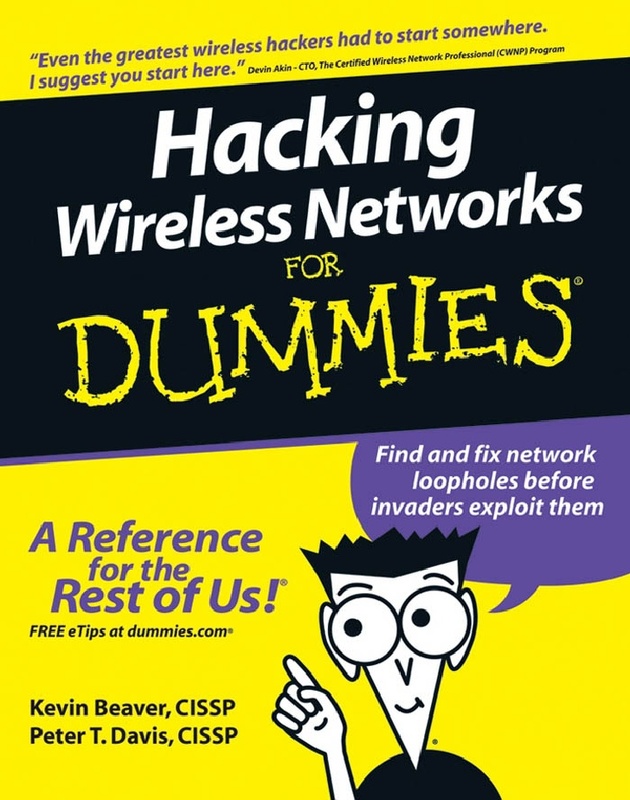 Download the Hacking Wireless Networks for Dummies. The password for the file is the domain name – “www.ethicalhackx.com” without quotes””. The am sharing the content of the book to get a brief introduction . Foreword …………………………………………………………xvii Introduction ……………………………………………………….1 Part I: Building the Foundation for Testing Wireless Networks …………………………………7 Chapter 1: Introduction to Wireless Hacking ………………………………………………………..9 Chapter 2: The Wireless Hacking Process …………………………………………………………..19 Chapter 3: Implementing a Testing Methodology ……………………………………………….31 Chapter 4: Amassing Your War Chest …………………………………………………………………43 Part II: Getting Rolling with Common Wi-Fi Hacks …….65 Chapter 5: Human (In)Security …………………………………………………………………………..67 Chapter 6: Containing the Airwaves …………………………………………………………………..81 Chapter 7: Hacking Wireless Clients …………………………………………………………………..97 Chapter 8: Discovering Default Settings ……………………………………………………………113 Chapter 9: Wardriving ………………………………………………………………………………………131 Part III: Advanced Wi-Fi Hacks …………………………..153 Chapter 10: Still at War …………………………………………………………………………………….155 Chapter 11: Unauthorized Wireless Devices ……………………………………………………..177 Chapter 12: Network Attacks ……………………………………………………………………………195 Chapter 13: Denial-of-Service Attacks ……………………………………………………………….225 Chapter 14: Cracking Encryption ……………………………………………………………………..255 Chapter 15: Authenticating Users …………………………………………………………………….281 Part IV: The Part of Tens ……………………………………301 Chapter 16: Ten Essential Tools for Hacking Wireless Networks ……………………….303 Chapter 17: Ten Wireless Security-Testing Mistakes …………………………………………307 Chapter 18: Ten Tips for Following Up after Your Testing …………………………………321 Part V: Appendixes …………………………………………..325 Appendix A: Wireless Hacking Resources …………………………………………………………327 Appendix B: Glossary of Acronyms ………………………………………………………………….341. Share your feedback on how the book is after reading. If you want to get a hardcopy of the book I am sharing the link from few ecommerce websites.